Last night I stayed up into the wee hours of the morning finishing The Hunger Games, like so many others who've been captured by this series. I first started hearing about them around a year ago. My friends started reading them, but I wrote them off. I'm not really into teen fiction. I'm not really into the futuristic genre either. However, I finally caved as more of my friends--whose opinions and tastes in literature I respect--read and raved. I too was captured by The Hunger Games plot. The plot is what drives this book, after all. I can't help but wish that the books wasn't a YA book, though. I longed for the writing to be a little meatier, although I have to say I'm glad the YA slot it holds kept the violence toned down. Due to an uprising in the nation of Panem, it's twelve districts must each send a girl and a boy to participate in the Hunger Games, which is a fight to the death, televised live for all it's constituents to watch. 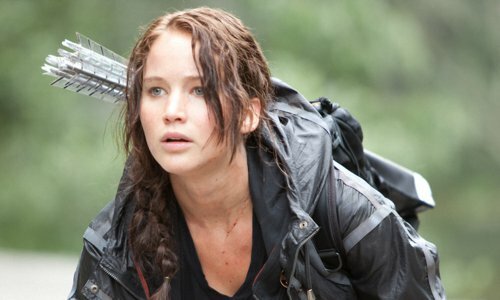 The Hunger Games follows Katniss Everdeen as she takes the place of her sister as tribute in the Capitol's annual games. One can't help but view the Hunger Games and it's arena as a futuristic version of Rome's gruesome games at Colosseum. Nor could I shake the image of Katniss and her companion for the games, Peeta, being herded onto the train headed to the Capitol as being not unlike the image of the Jews being carted off to concentration camps during the Nazis regime in Germany. Clearly, this book is a statement about government overreach and corruption. Also, this book calls our idea of entertainment into question. In a nation that takes in a steady diet of entertainment via reality TV in such shows as The Bachelor, Big Brother, and Survivor, such parallels are also obvious. These shows may feature challenges both mental and physical, but the real entertainment value is in the use of gossip, back-stabbing, character assassination, and false alliances. But it's all in good fun, we tell ourselves. After all, these people sign up of their own free will. Nobody actually gets hurt. But perhaps the real question is why do we find these shows such addicting entertainment? Most books are better than their film adaptation counterparts. However, I can't help but wonder if a film adaptation of The Hunger Games will add a dimension to the questions Collins raises in her novel that could not otherwise be appreciated. In the book, the games are intended to be televised and watched by the entire population. And so, the movie reenacts this element of the novel. It is true that this story showcases characters who portray humanity and selflessness. And many of us--me included--plan to watch the film with the intention of cheering on these characters, and the good qualities they represent. In the end, Katniss and Peeta choose to not play by the rules of the Hunger Games, instead undermining the Capitol's power to control to some degree. As thousands line up for tickets to see The Hunger Games, I cannot but help to see the irony that instead we could be proving the most chilling implication of all: that we are not so unlike the Capitol crowds that clamored for more gruesome Hunger Games exploits. Instead, we take the Capitol's place as the audience. And actually, deep inside each human heart we have the capacity to be just. like. them.